I want this in my hometown! Thank you Excela Health in Greensberg, Pennsylvania for posting this to our Facebook page! We are so glad you did! 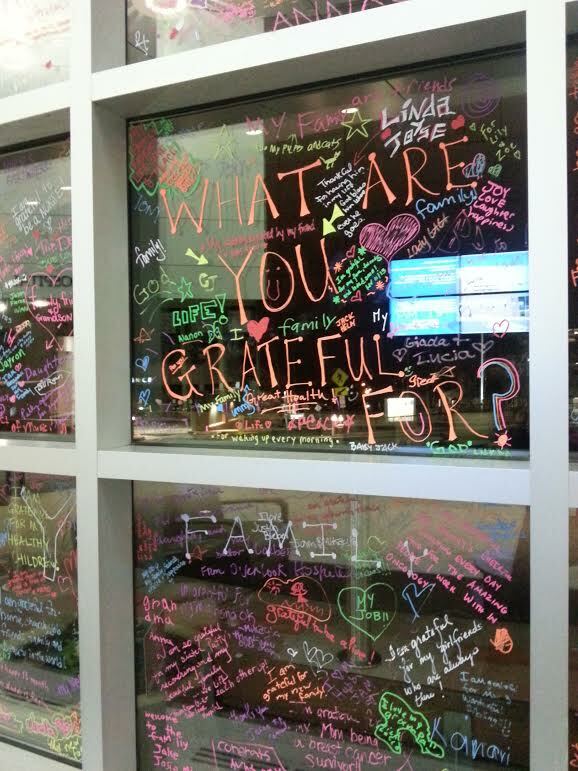 During November, Excela Health employees, patients and visitors have the opportunity to express their thanks on ourGratitude Graffiti Walls. The project, sponsored by the Nurse Retention and Recognition Committee, benefits from the designs of Seton Hill University art therapy students Meghan Fischer and Kristy Walter, who also assist Excela Health’s Hospice families. 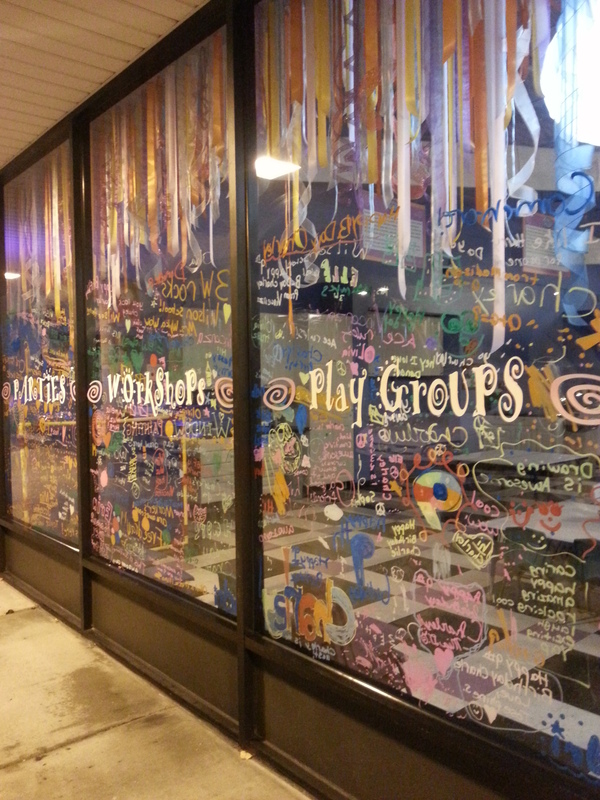 Washable paint markers are available close to the interactive art displays: Frick Hospital Second Floor corridor near the cafeteria; Latrobe Hospital, First Floor near the Little Shop, and at Westmoreland Hospital at the Side Street Café. Take a moment to post a note. Back in February of 2016, The Gratitude Graffiti Project was going strong in Vancouver, thanks to MaryJo Wagner (see below with Lucila!) who took up the mantle of reaching out to community partners in Vancouver while Lucila was in France. Blaq Sheep Coffee was one of the first places TGGP started in Vancouver and it is SO NICE to see them still participating after all these years. This community truly feels the love. Thank you! Gratitude Graffiti Project in Grand Rapids, Minnesota! Thank you to our friends and healthcare colleagues at the Grand Itasca Clinic & Hospital in Grand Rapids, Minnesota! You make all the difference in the world. WE love that you are grateful for sushi and supervisors, snow, coffee and grandchildren. All these things together make up what makes our daily lives so wonderous and precious. These happy moments are gifts that help us to keep giving more to others and replenish our souls. Hope you will join us again this fall! 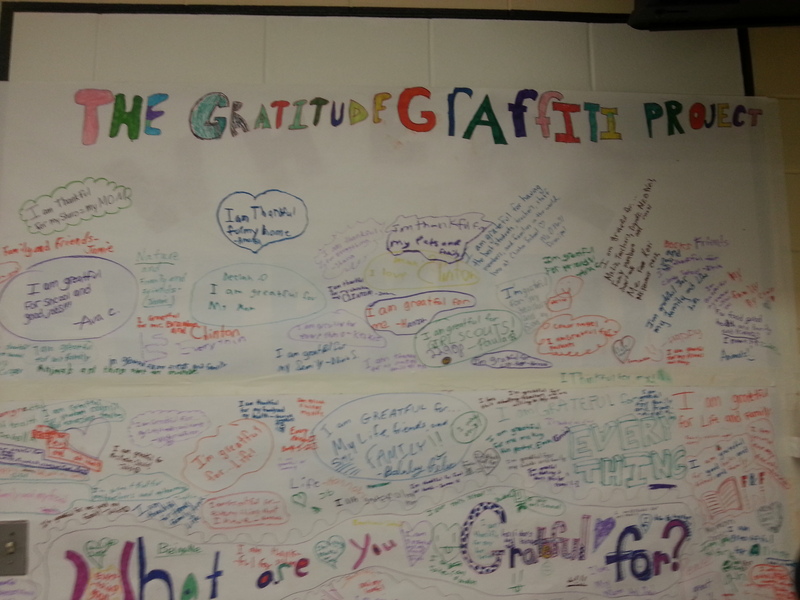 We have gratitude graffiti friends at Friends School in Virginia! Thank you to our school aged friends and their teachers, especially Kristyne Lotito at Friends School in Virginia Beach who shared these great photos on our Facebook page! It is so colorful and bright and a great way to welcome people into your school. 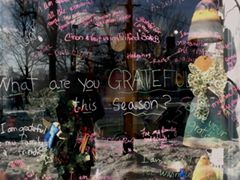 Whenever The Gratitude Graffiti Project is at the threshold of a door or in the front window, it makes people feel like this place is blessed with good vibes and love. Thank you so much for all you do and we hope that you will join us on the journey again this fall! 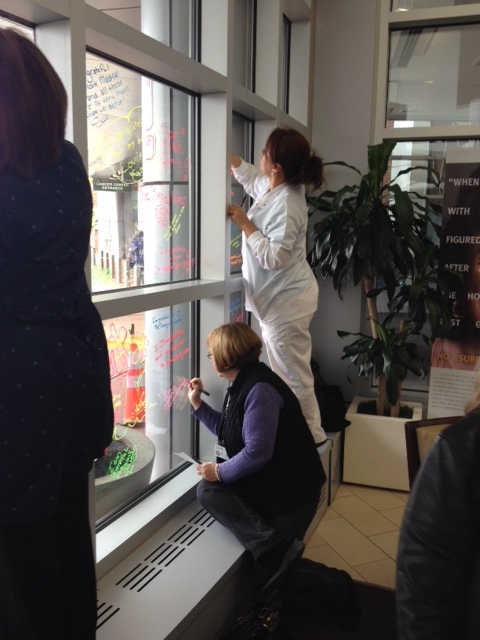 Gratitude Graffiti is Growing Strong at Atlantic Health System, New Jersey! 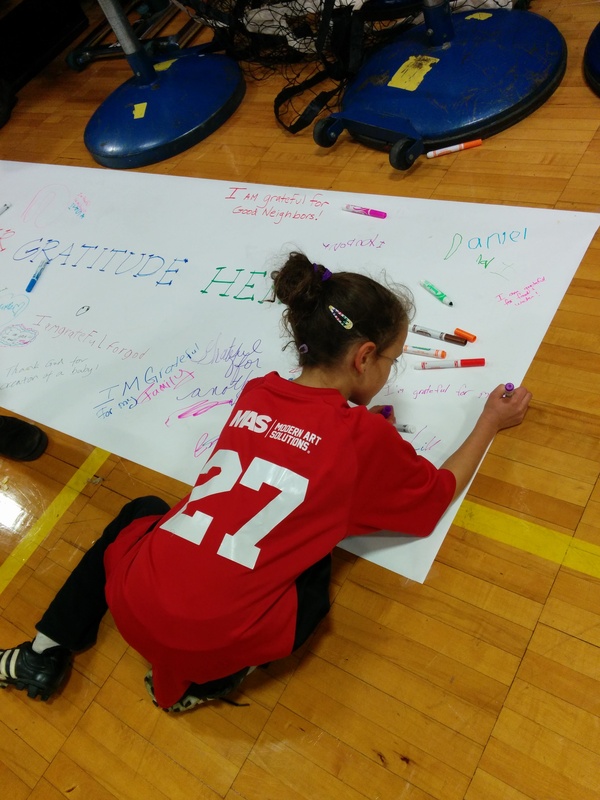 The Gratitude Graffiti Project has been going strong and growing under the caring and nurturing Healing Arts Program and the Community Health Department who saw immediately the benefits of bringing the project into the health care system. Thank you to Ania Lesiak, Maria Lupo and all the staff of the Healing Arts Program for capturing these images and for championing the project at over five different hospitals and corporate sites and to Robert Seman for the video! I hope we keep partnering together for years to come. It gives me great joy to see how patients and staff respond with such an outpouring of love for the care they receive at your hospitals. A link to the Atlantic Health System 2016 Gratitude Graffiti Project video is here. Thank you to Lake Health Medical System in OHIO! 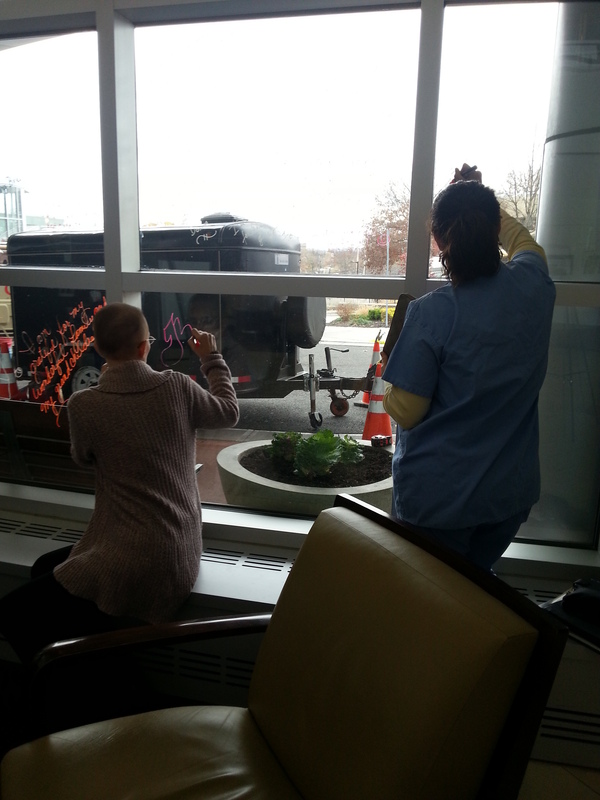 For the past three years, Lake Health Medical System has been leading the way and bringing The Gratitude Graffiti Project to its staff and to the community! They are joyful, collaborative and truly embody what this project is all about. What is so great about Lake Health are the VIDEOS that they have created over the years to create a visual documentary of The Gratitude Graffiti Project as it unfolds and as people participate. You can see the physiological changes in people- they are happier and glow as they think about what they are grateful for, in their own lives and want to share it with hugs and smiles to those around them. Thank you to Vaia Lappas-Gilchrist, Certified Health and Wellness Coach/ Exercise Physiologist at the Lake Health Wellness Institute for reaching out to us and making it happen! As a fellow nurse, I know how grateful we are for our profession and our calling to serve and it is nice to come to work with others who have such open and grateful hearts, and to hear that people are thankful for the care and compassion you provide, every day. THANK YOU, Kent State University! 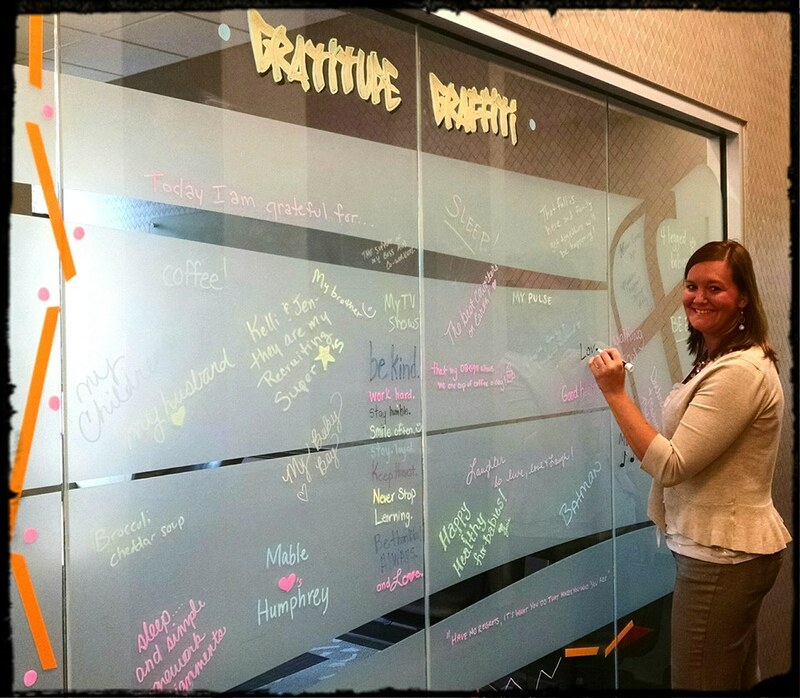 In March 2017, Kent State University’s Employee Wellness department started a March Month of Gratitude, and The Gratitude Graffiti Project was their vehicle for spreading the love at multiple sites. With close to 100 locations spread over seven campuses (phew! ), they had an amazing response. Click here for a link to their website and click on the image to view the slideshow of AMAZING images. What is so impressive is how they modified the project to each location so whatever worked best was used: glass windows vs poster boards and post- it notes. We have always believed that the medium of expression is secondary to the what is actually expressed and we also believe that the art is already there, given how many people participate and all their different styles, thoughts and creativity that are expressed. It is truly an example of what a great community Kent State University cultivates. You can also go directly to the Flickr webpage for a slideshow of the pictures. WHY IS PRACTICING GRATITUDE SO IMPORTANT? Thank you to Kim Hauge, Director of Employee Wellness and all the staff and students at Kent State University! We hope you will join us again! 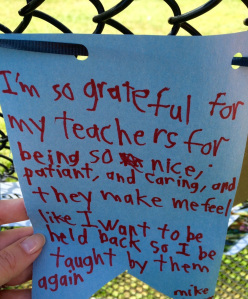 Sometimes we find The Gratitude Graffiti Project through a simple google search. Turns out that for National Library Week last year, the librarians at the Skokie Public Library brought The Gratitude Graffiti Project there and the patrons were so enthusiastic for a chance to express their gratitude to the staff at the Skokie Public Library, for the space and for the great services and books they have available. “To say we were blown away by the enthusiasm and responses we received is accurate. Patrons were consistently thrilled to have a chance to share a bit about what they love at their library. We had community college students who excitedly took a break from their quiet study on the second floor to doodle and say “thank you” for the consistent and comfortable space. We had teens who got into deep conversation about gratitude following the prompt of sharing on the board. We had a teen at an author visit express her appreciation for the fact that she can always find books with girls like her–from biracial backgrounds–at our library. We even had a three-year-old storytime regular who was so excited to share what she loves about the library, she wrote her first letter ever on the gratitude graffiti board. That’s huge. That’s what the library can inspire in the people who visit. So here is my takeaway, and my challenge and question to others: We know, anecdotally, that the library is a place that is valued and appreciated in the community, but we don’t always give our patrons opportunities to express that value and appreciation. 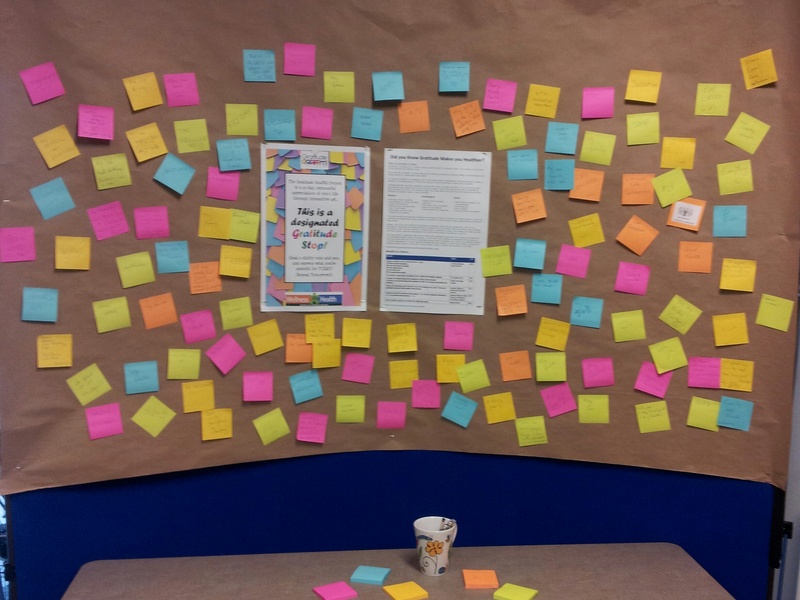 Comment cards tend to end up about complaints, but we don’t always have great methods for capturing the good and the positive impacts the library has. Then, with a relatively low-stakes initiative like the Gratitude Graffiti project, we get to see not only what we add to peoples’ lives, but we can see that they’re thrilled to share their appreciation with us. It’s like they’ve been waiting to share their feelings but never found the right moment until we asked. Thank you to Amy Koester for sharing your experience and we look forward to joining us again on the journey! So glad you got so much out of it. Keep doing the great work you do. Counting down to The Gratitude Graffiti Project 2016…. It is hard to believe that Lucila and I started this project five years ago. Just today I heard from a college in Massachusetts and I am amazed at how far it is come. Some updates from us: Lucila and her family have moved ‘across the pond’ and I am hopeful that as she is acclimating to her new surroundings she will bring gratitude graffiti with her and make it flourish as she has done in Vancouver. In fact, the whole day is about having intelligent conversations on how creative placemaking impacts public health (two of my favorite subjects!). The Art of Healthy Communities is sponsored by New Jersey Health Initiatives, Atlantic Health System, and National Housing Institute/Shelterforce magazine. It is made possible with the generous support of the Geraldine R. Dodge Foundation, National Endowment for the Arts Our Town program, and New Jersey State Council on the Arts. 12 more days until we start! Let’s do this together. 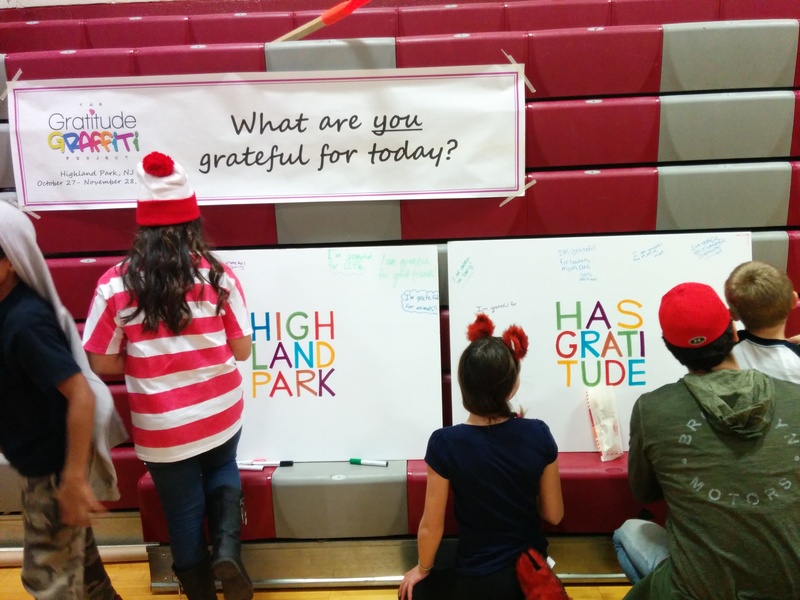 Welcome to the Gratitude Graffiti Project 2015! 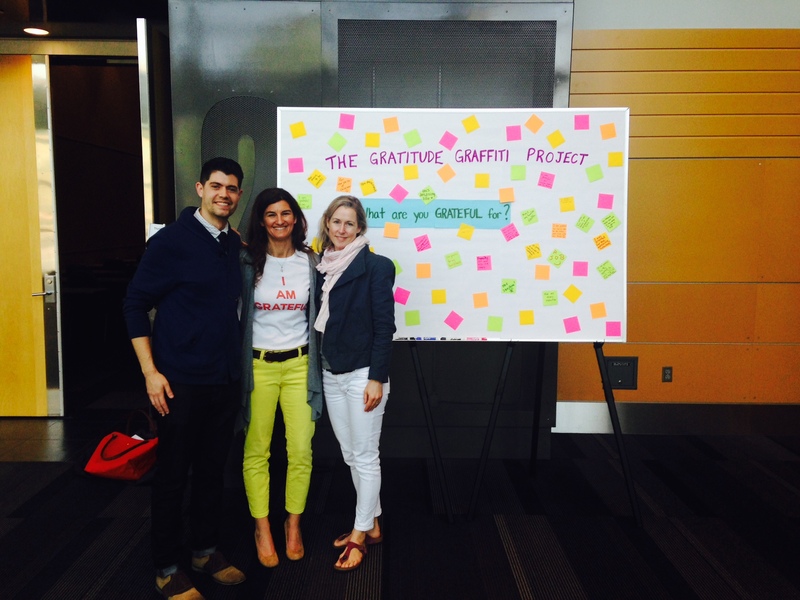 Welcome to the Gratitude Graffiti Project 2015! I hope that you can find a moment to create your “Gratitude Stop” or visit one around town! A “Gratitude Stop” is simply a place where you can share what you are grateful for and inspire others to do the same! Looking from the outside, my life has looked like a happy and successful one. I have had a successful life coaching career, reaching and exceeding most goals I set out for myself. I have a healthy family, a husband, three well adjusted daughters and a beautiful home in an idyllic tree lined street. Looking in, however, I have struggled with feelings of anxiety, depression and “not good enough”. For as long as I can remember I have been on the search for happiness. What I hadn’t realized is that I had unconsciously “bought into” one of the most prevalent beliefs of our society today – the belief that Happiness comes from something outside of ourselves and it will come (for real and everlasting) when we finally reach whatever we deem as “perfect” in our mind. The “perfect” job, the “perfect” husband or family, the “perfect” Zen, even. I achieved my “perfect” world over and over again, and within minutes, hours or days of achieving my goals I became desperate and disappointed, judging my achievements and suffering through my search for happiness, ready to reach for the next level of “perfect”. This belief came with a huge consequence: I gave up all control over my happiness. I was so busy wanting to reach my goals to feel “good enough”, that I could not see what I already knew deep down. The chase for the “perfect” life ended when I realized that I had it all backwards. My happiness was not something I had to chase but something I had to train in, from within. My teacher, Geshe Kelsang Gyatso, says that the real cause of happiness is inner peace, which can be found only within the mind, not in external conditions. So how does one train from within to feel happy? How does one develop inner peace? For me, it started with a shift in belief that I CAN train my mind (like we do the muscles in our body) to feel happy. What I have since discovered is a set of practices that if contemplated, studied and used can single pointedly and methodically nurture us from within and transform our world. One of these is the practice of gratitude, so simple that it’s often overlooked as a skill to develop, a choice in lens from which to see the world moment by moment. And this is why Candice (co-founder of the project) and I, along with now the many volunteer community champions, decided to bring the practice to our communities through The Gratitude Graffiti Project. Realizing that we need support and the reminder to practice gratitude our project is now part of towns all over the world helping people develop this life changing skill. 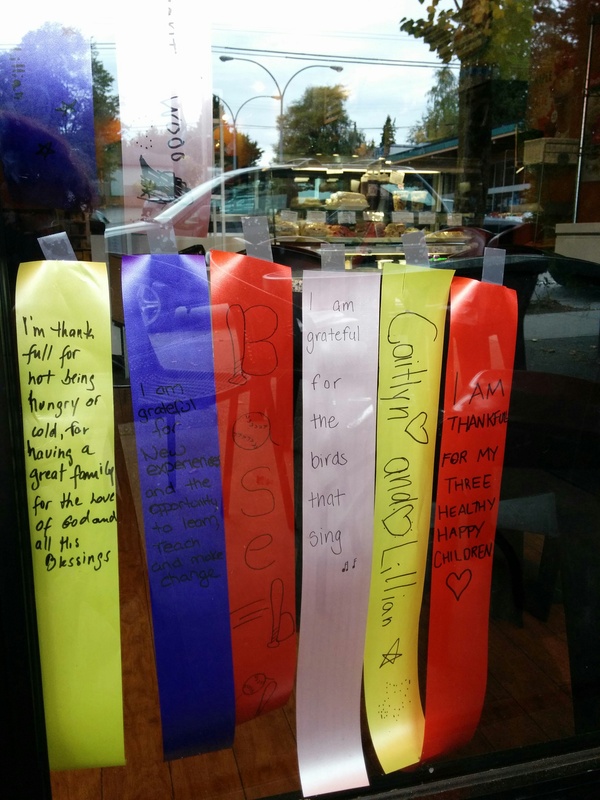 Within a few years, our “gratitude stops”, inviting people to express their gratitude on windows, ribbons or paper, are in hundreds of locations from NJ, to California to Canada and Hong Kong, including schools, hospitals, retail stores, a hospice, restaurants, coffee shops, libraries and your homes. I believe the reason why our project is spreading like wildfire is because we no longer want to feel dissatisfied, busy and overwhelmed. We are all longing to feel happy but we haven’t learned “how” to methodically and systematically increase our feelings of inner peace. As many participants have now reported, our project provides the “how” and it’s so very simple. What are you grateful for today? Now go share it! 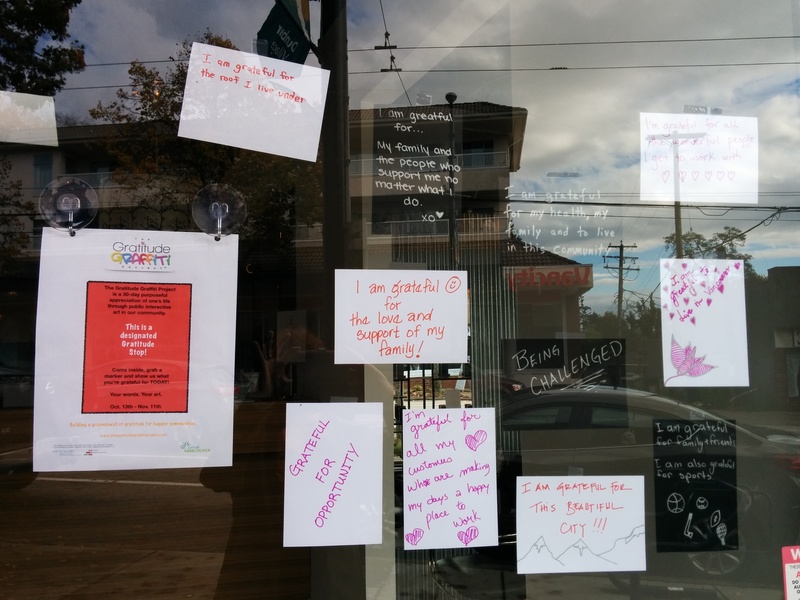 Vancouver, BC: Get your gratitude on with these 24 Gratitude Stops! The Gratitude Graffiti Project kicked off on Sat. 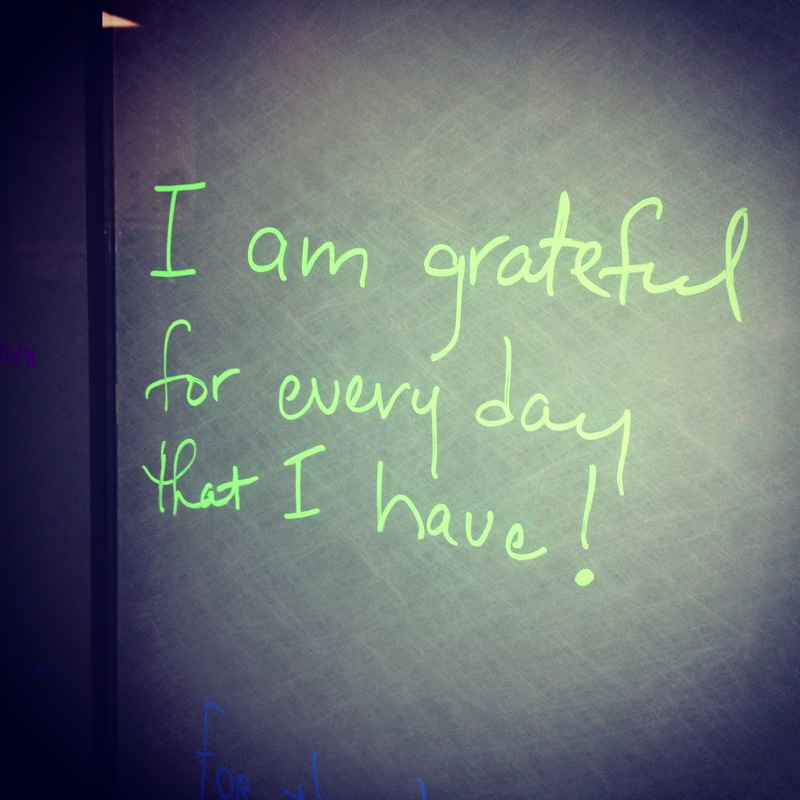 19th, 2015 and it already has 24 Gratitude Stops – and growing! – ready to help communities practice gratitude! Find a Gratitude Stop near you, go inside, grab a marker and tell us what you’re grateful for that day. Repeat the next day! Better yet, become a Gratitude Stop yourself and let your whole community share their gratitude! 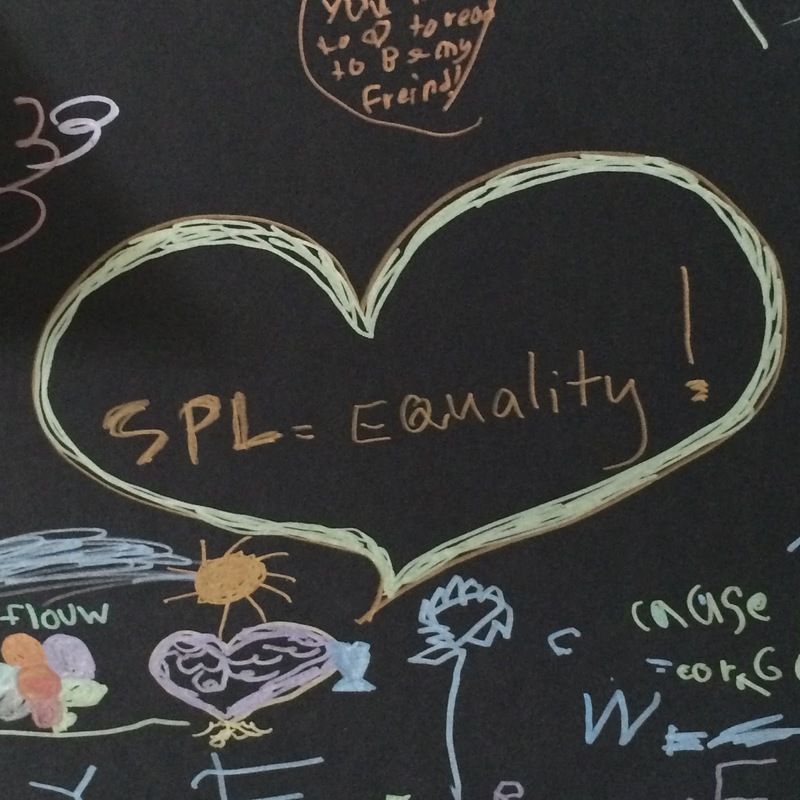 The Gratitude Graffiti Project 2015 Participants (to date)! “There is a lot to be thankful for on a daily basis. Here in Amman, Jordan there are daily reminders of how lucky we are to be with our family and friends in a safe environment. Some of our students have experienced the turmoil in this region firsthand and those who may have encountered it second hand still feel as though they too had a firsthand experience. 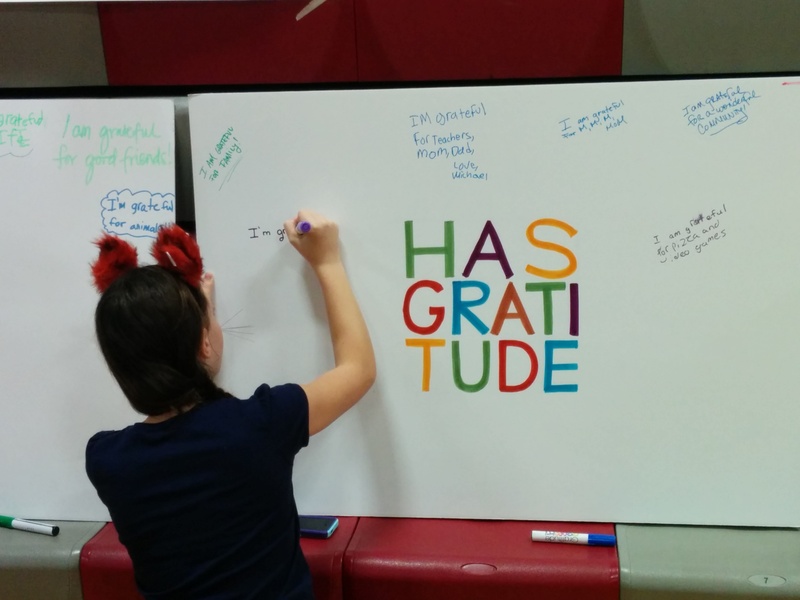 The Gratitude Graffiti Project was a huge success at ACS. It was an easy but thoughtful way for students to reflect and identify what it was they were thankful for and why. On our bulletin board we put up the phrase, ‘Gratitude, turns what we have into enough.’ This led to a lot of impromptu discussions in the hallway about all the things that are lives are consumed by and whether or not we need them or are just lucky to have them and what life would be like without them. Needless to say there were many mixed emotions and great conversations to eavesdrop in on or engage in. As we took the board down this week, (it has been up since December) the students asked when we would be putting it back up. 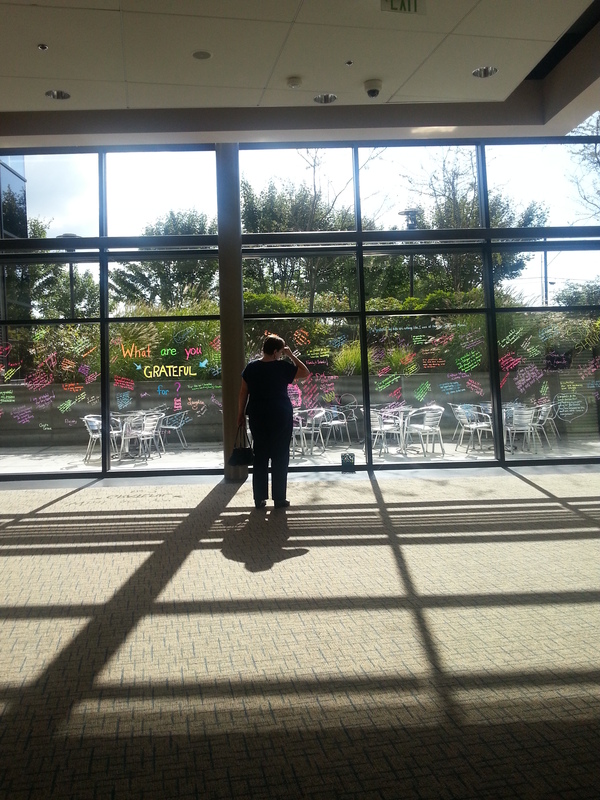 So we have decided to take our Gratitude Graffiti to the windows outside our principal’s office so that it can continue for the rest of the school year. The students and teachers of ACS would like to say thank you for bringing such a simple idea to life. We have had a wonderful experience publicly expressing our gratitude and will do so for the rest of this year and most likely many years to come. We would be remiss if we didn’t acknowledge some people who really understand the meaning of this project. Here are some examples of what you can do on a school hallway, in the lunchroom cafeteria, on a bulletin board. This is just an example of how gratitude is a shared, universal and basic human need. 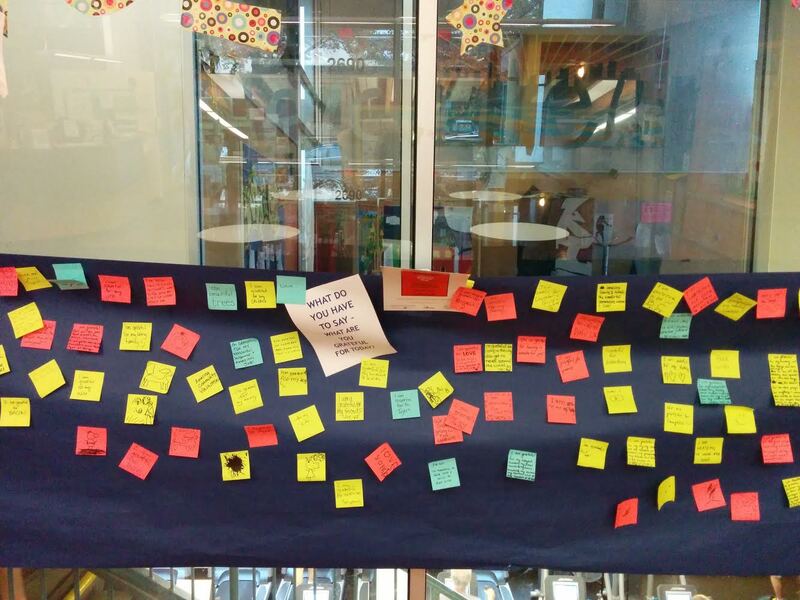 Thank you to the Vancouver School for this awesome display! As with life, you have to sift through and find what you are grateful for. These kids have a lot to be grateful for: what do you see? 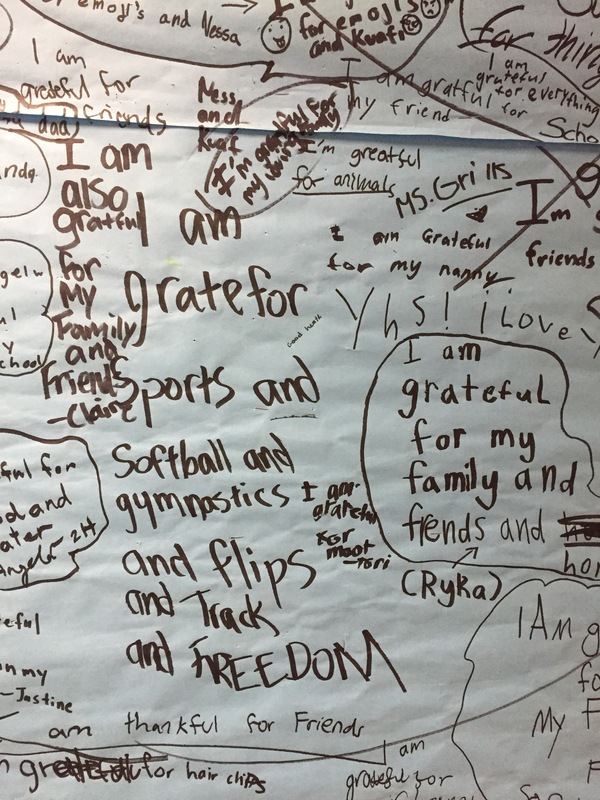 Thank you to Clinton Elementary School and a special girl scout troop that put this Gratitude Graffiti Project wall up this fall! So colorful! We are Clinton! Thank you to the Messy Artist in East Hanover NJ for providing our children an outlet to express themselves, everyday! 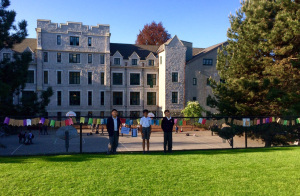 Thank you the students of St. George Junior School in Vancouver, British Columbia! You surrounded your school in love and good thoughts! Grateful to Anna Berrian, School Nurse extraordinaire and fellow UPenn Nursing School Alumni for bringing this to her awesome students and staff at Revere High School in Massachusetts! In admiration of the strength and resiliency of the people of Boston, I thought this one was very appropo to post. 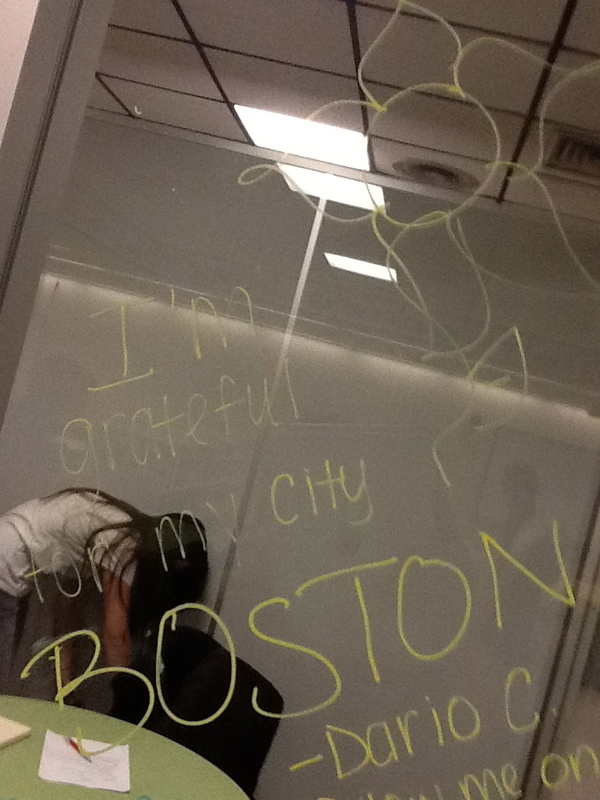 We are grateful for the City of Boston! 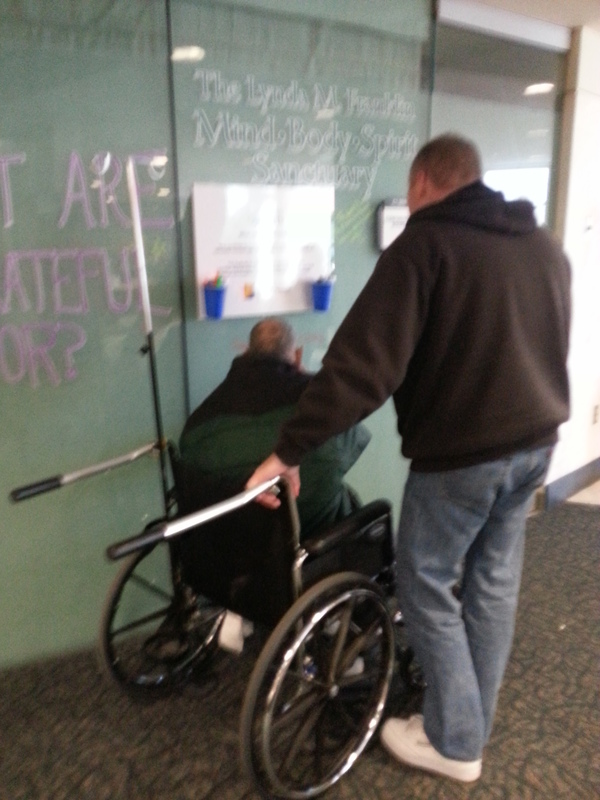 To see more of the Gratitude Graffiti Project at Revere High School click here. 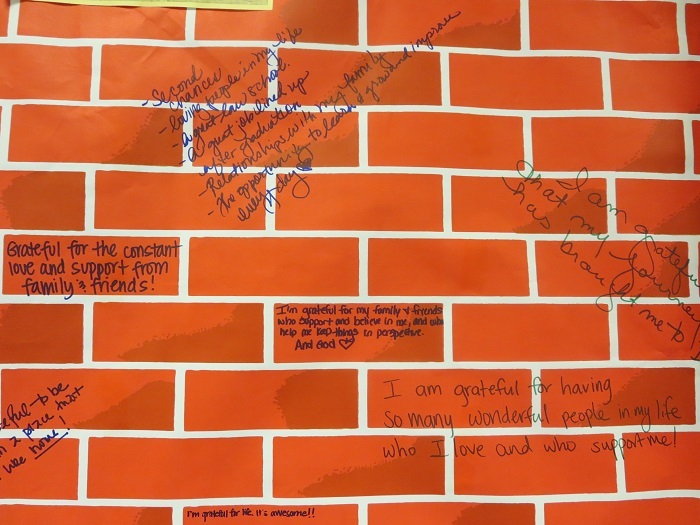 A shout out to our high school peeps at Boylan Catholic High School in Rockford, Illinois who made a video of how Gratitude Grafffiti works at their high school! Ah, kids and technology. 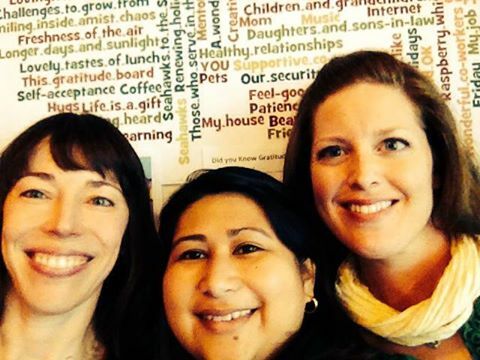 Thank you to the Redwood Day School in Oakland, California! Isn’t Malala’s book amazing? 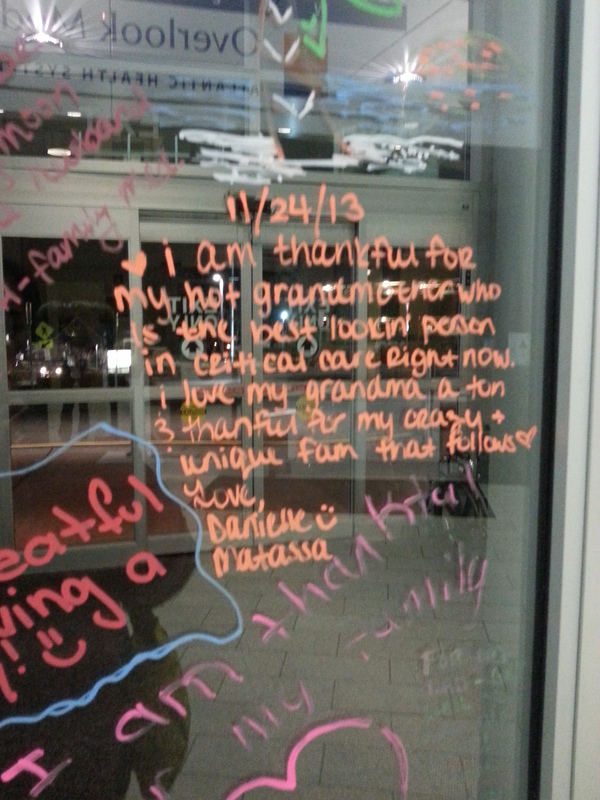 So glad you incorporated TGGP into your way to express your gratitude all over your school! Check out their website link above to see all the pictures! 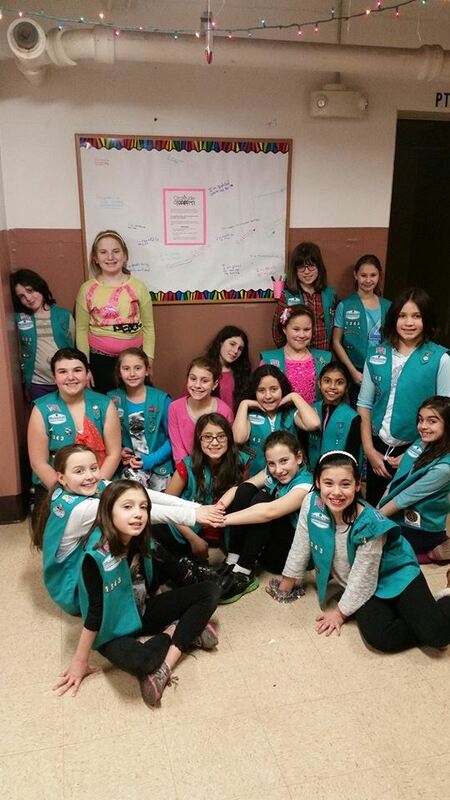 Thank you to Girl Scout Troop 1343 in NY for showing you have big hearts and sharing the Gratitude Graffiti Project at your school! Girl Power! You are already changing the world. Keep it going in 2015 kids! We wanted to highlight some great things that have happened to this project in the great state of Washington. Thank you to the Washington Parks and Recreation Association for a phenomenal conference! Last year, Lucila and I had the rare chance to present together at the Healthy Worksite Summit in Washington. Thank you to Jon Smith, Perri Bernard and Julie McDowell for being such great coordinators and champions of the project! I personally love this photo of a conference attendant taking a moment to see what people wrote as the reflection of the words fall on the ground and the sun catches the color of everyone’s grateful expressions. Thank you to Loalei Walker the Washington State Department of Health for making our project part of employee wellness and the celebration of the 25th Anniversary of the Washington Department of Health! 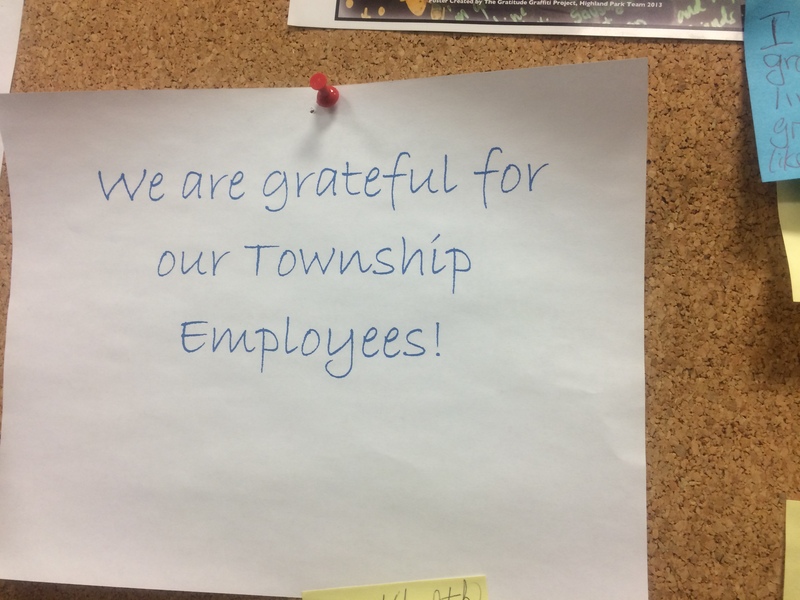 We are GRATEFUL for all the work you do! And thank you for creating this great post- you totally got the meaning of the project! You may have noticed thecolorful “wordle” posters on display in the Tumwater campus lobbies. They are the results of the Gratitude Graffiti Project, one of several events launching the agency’s Wellness@Health program in January. 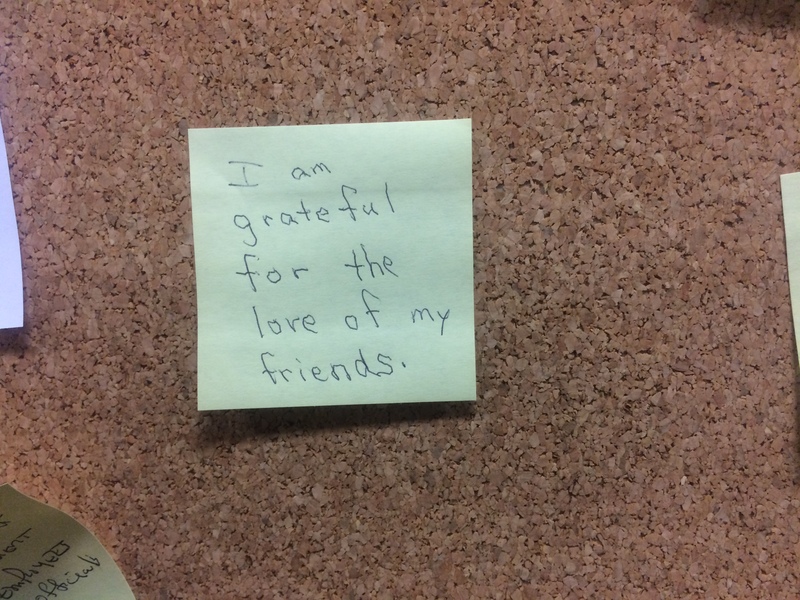 Throughout the month, staff were encouraged to share the things they’re grateful for by writing on sticky notes and placing them at the “Designated Gratitude Stop” in their building. Responses ranged from cherished family and friends to good health and strong faith; from coffee and sunshine to beloved pets and the Superbowl-bound Seahawks. Improve the quality of your sleep. Increase your vitality and energy. Finally,here is an image from the Washington State Penitentiary also found on our blog entry on bringing TGGP to the workplace. It is amazing how you can find gratitude, even in in the unlikeliest of places. 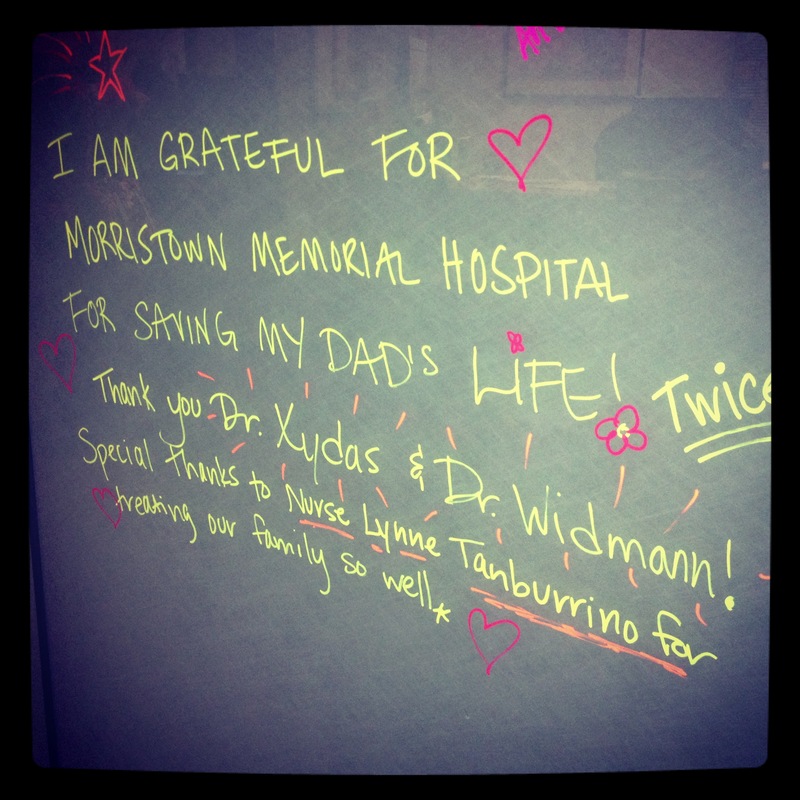 Starting in 2013, The Gratitude Graffiti Project paired up with Atlantic Health System in New Jersey as part of their community outreach program, to see if a project on expressing gratitude had a place in a hospital setting. A place where people are sick, receiving care around the clock from competent caring hands, welcoming life, dying with dignity, laughing, resting, recovering, struggling, and healing. So they chose the font lobby with a great amount of glass windows and doors and left a bunch of markers for patrons to use. Here are some pictures of the end result. As a follow up, the Atlantic Health System expanded the project in 2014 to all four of their hospitals and kept it going way past Thanksgiving, into Christmas because it was so well received and therapeutic in healing. Some of these pictures are on our TGGP brochure which all are welcome to use and share. You may not think of the workplace as a place to feel or even express gratitude, and yet, most adults spend most of their waking lives in their workplace, doing just that: work. 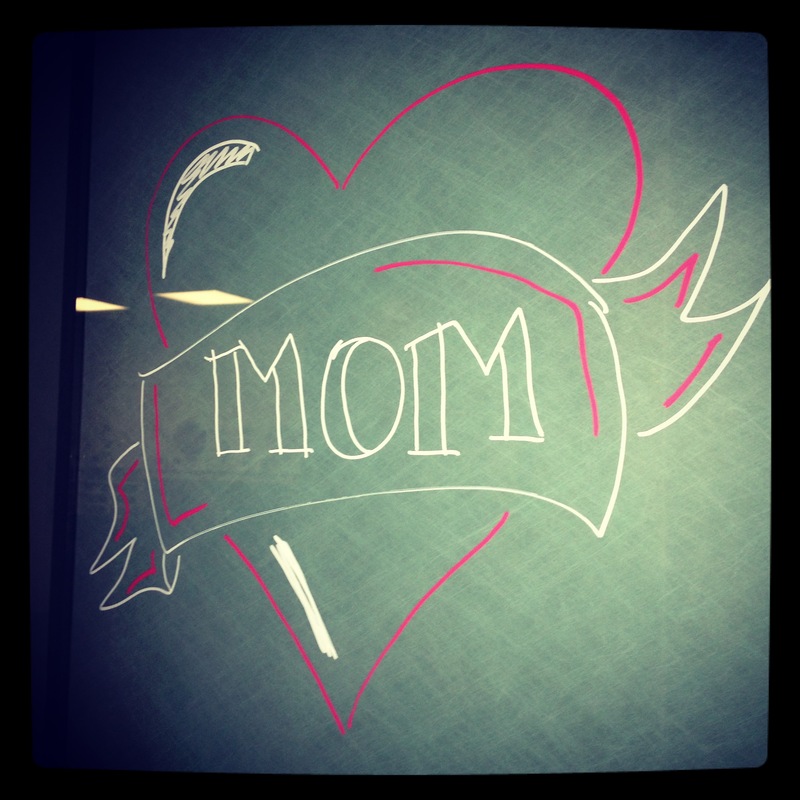 But what if someone suggested that you leave your cubicle, pick up a pen or a marker and take a moment to be thankful ? 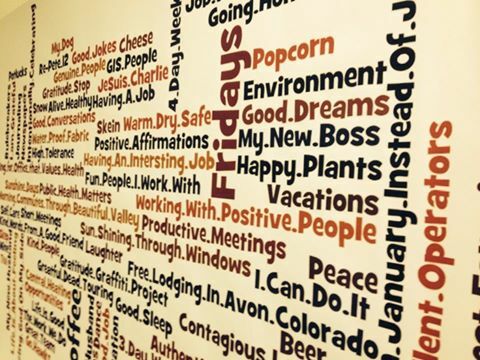 In 2014, there were places all over the country that brought this to their workplace and have found it just as transformative and a great community builder. 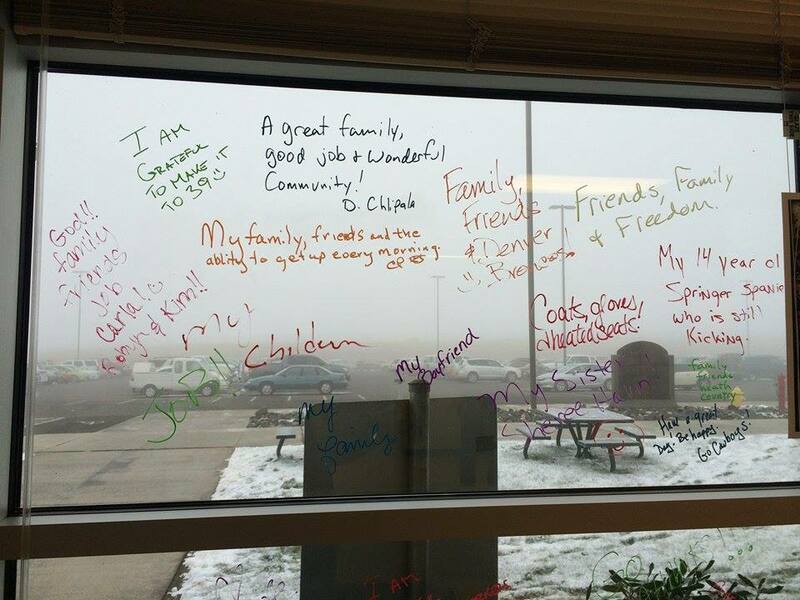 Employees thought it was a crazy but fun idea to write on the windows to their conference room and fill the glass with positive affirmation of thankfulness. 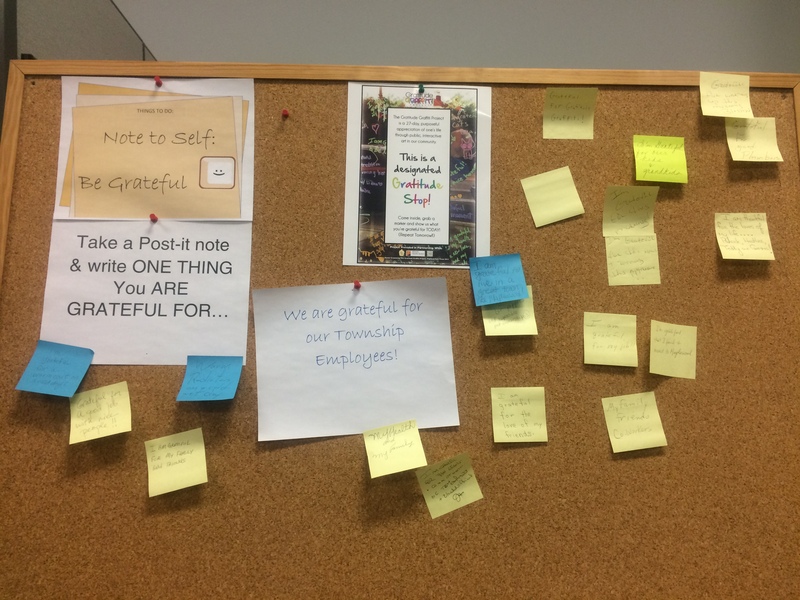 A play on words that we created specifically for the workplace is: “Note to Self: BE THANKFUL!” and asked people to write on post it notes and stick it on a board. As we have always said, changing a mindset shouldn’t be hard. In fact, it should be fun, thoughtful, and creative. Stretching our minds may push us out of our boundaries (and maybe those boundaries are the physical space) to see what has always been there: all the little and many blessings we have in our lives. Talk about a dream come true: Lucila finds it amusing that I literally aim for a location in my mind and somehow it manifests. Turns out, Karen Pierce, Director of Wellness Promotion at Georgetown University Law Center heard the presentation via the National Wellness Institute this summer and brought it to DC! Here’s to hoping we can expand it to other neighbors in the DC area next year. 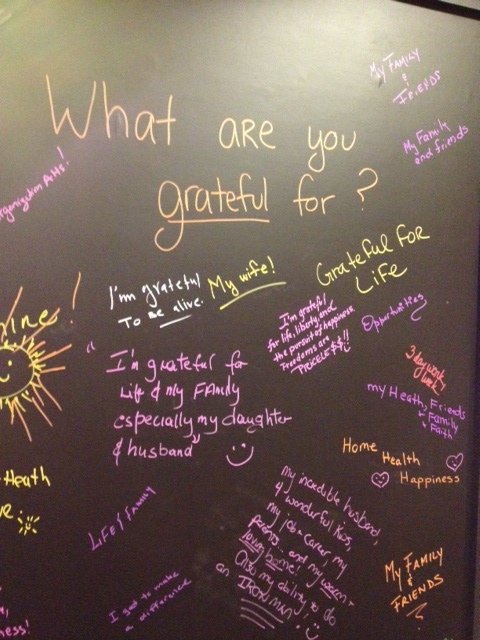 From Washington State to the Nation’s capital, we are spreading gratitude graffiti! Now, can I get a shout out from Detroit? 🙂 Woot Woot! Here is a blurb and pictures from their awesome event. 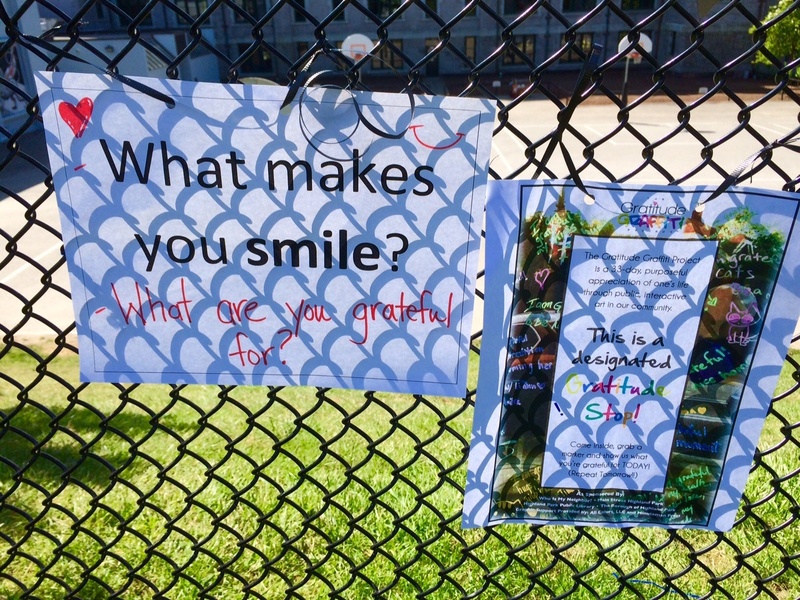 “The Center for Wellness Promotion at Georgetown University Law Center offered a much shorter version of the 40-day Gratitude Graffiti Project. 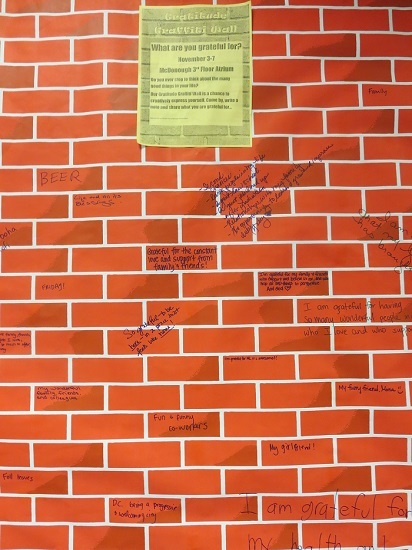 We posted a simulated brick wall on one of our floors for just one week and asked students, staff and faculty to tell us what they were grateful for. The wall went up bright and early on a Monday morning and the response itself was gratifying. Our law center community came together to share their gratitude. Our Early Learning Center with children from 18 months to 5 years old also participated and the teachers posted their responses. Three more Gratitude Stops in Vancouver, BC! Three more Gratitude Stops in as many days in Vancouver! 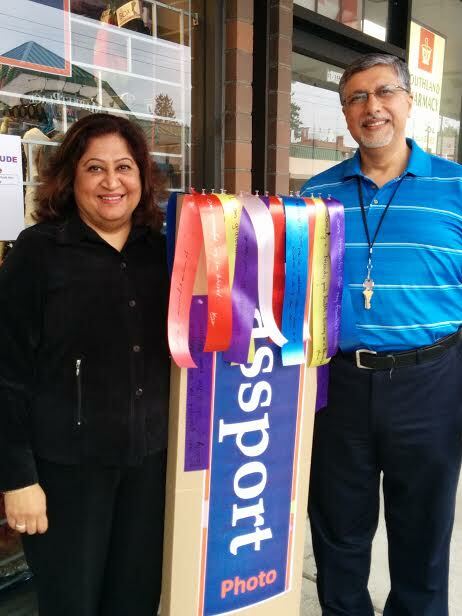 Thank you to Kerrisdale Community Centre, Dunbar Community Centre and Vital Health and Wellness for your support! Take a moment to stop into these welcoming facilities and show your gratitude. We are constantly updating this page since we don’t officially start until November 1st but check it out and see who is on board! What does gratitude look like in a community? You’ll soon find out! Gratitude Graffiti Project Champions are popping up everywhere- some in places we planted seeds in years ago and are flourishing now; others are new communities that are taking a leap of faith and joining us on this journey to find the joyful, grateful heart. 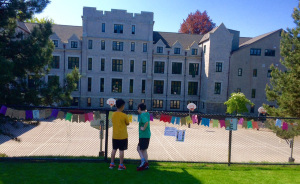 It turned out that not only was Vancouver ready for it, but schools and old friends and new neighbors have embraced our “Gratitude Graffiti” concept and are helping Lucila to make Vancouver one of the healthiest places on earth. In their second year they are expanding not only throughout the community but also in their scope of reaching more schools and teaching a future generation about gratitude and mindfulness. The different dates of Canadian vs. American Thanksgiving has not affected the project at all; in Lucila’s mind she is just pleased as punch that people are practicing mindfulness, anytime of year! As for me, it turns out that I fell in love all over again last fall (and continue to do so!) with the love and support I have received from our sweet town of Maplewood, NJ. I found great company among women and men who loved the idea of spreading this project all over town. I love that my township and my health department saw the vision of what the project is all about and threw their full support behind it when I wasn’t sure how I was going to afford doing the project. I love that we came out strong and were cited in the Wall Street Journal as one of those great communities to live in, because collectively, we reflect and embody a host of grateful people- which people can see as they walk or drive by and see the writing on the wall. Old and new friends who have the heart of fearless lions (needless to say they are fiery health educators and health promoters) who said, “YES! Sign me up!” and championed this in their communities all over. It may be one location. It may be one school. It may be one scribble on a piece of post-it stuck on a wall. It just may be one block in a large metropolis. But it is the start of something. It is a place where people will slow down. They will contemplate. They will write or draw feverishly, with gusto ~ or slowly and with feeling. But however it may manifest, the end result will be this- they will leave happier and more content, and hopefully come back for more. What does gratitude look like in your community? Join us and find out…. 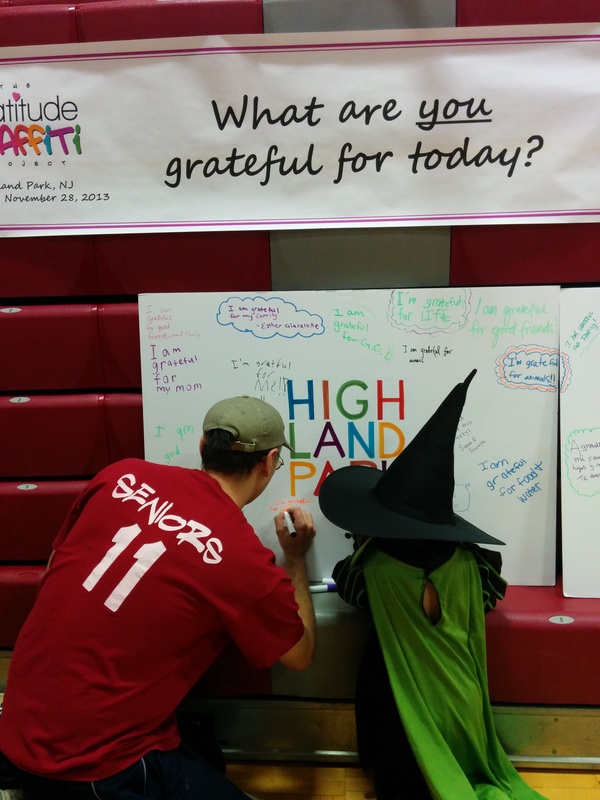 Highland Park Kicks Off Gratitude Graffiti Sunday October 26th!! Even better…. take a walk through Highland Park this week and grab a marker! The project will run through to Thanksgiving Day! 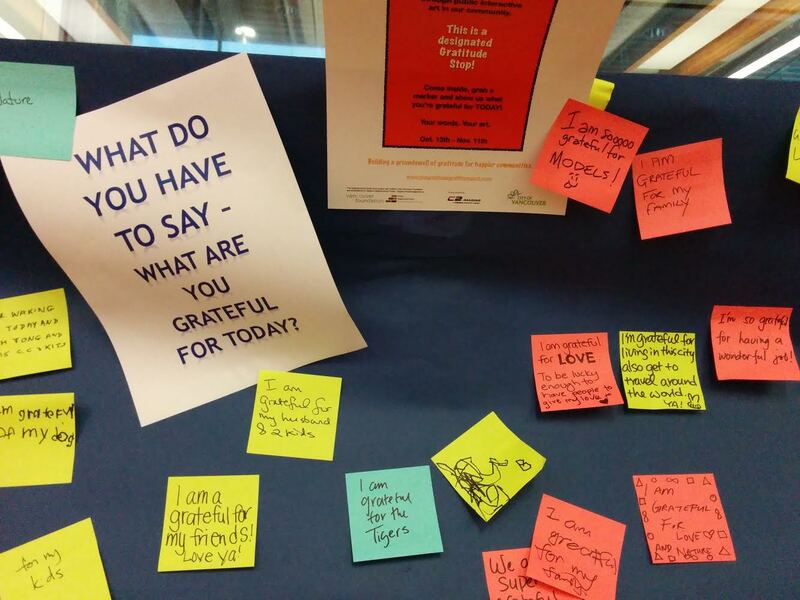 Vancouver, BC: The groundswell of gratitude is building! 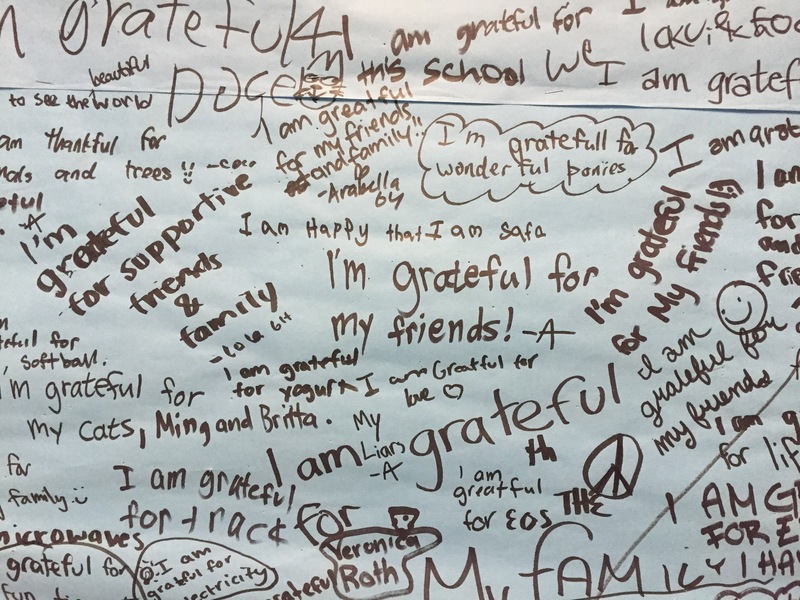 Only one week into The Gratitude Graffiti Project and we have reached 15 Gratitude Stops – and growing! – ready to help communities practice gratitude! 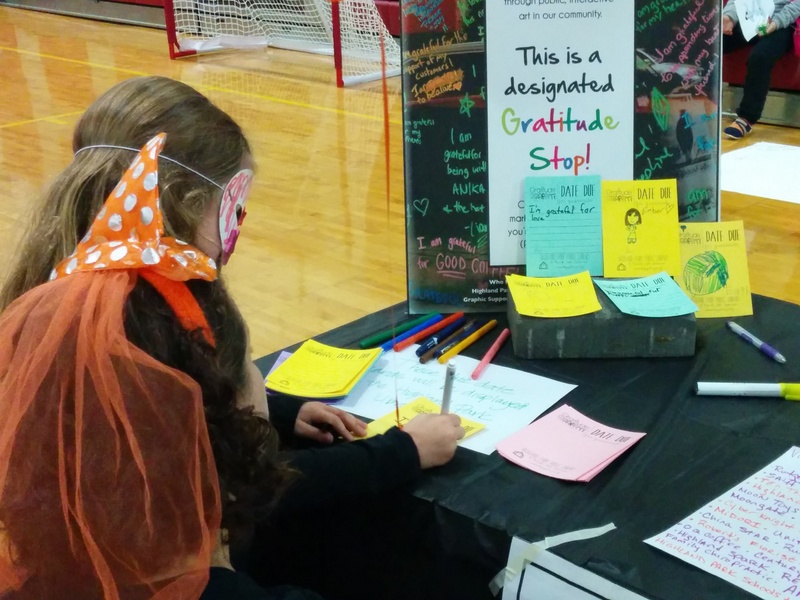 Find a Gratitude Stop near you, go inside, grab a marker and tell us what you’re grateful for Repeat the next day! Better yet, join this infectious movement and become a Gratitude Stop yourself! You can let your whole community share their gratitude! The Gratitude Graffiti Project 2014 Participants (to date)! Vancouver, BC: Get your gratitude on with these 14 Gratitude Stops! It’s not even the official launch date, and The Gratitude Graffiti Project already has 12 Gratitude Stops – and growing! – ready to help communities practice gratitude! 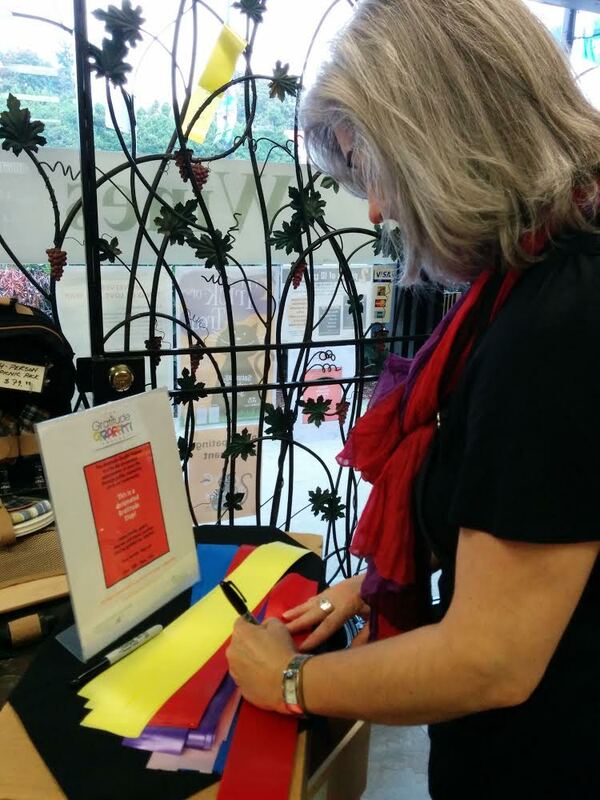 Writing a gratitude message to go on the “gratitude vine” at Village Wines on W.41st Ave. 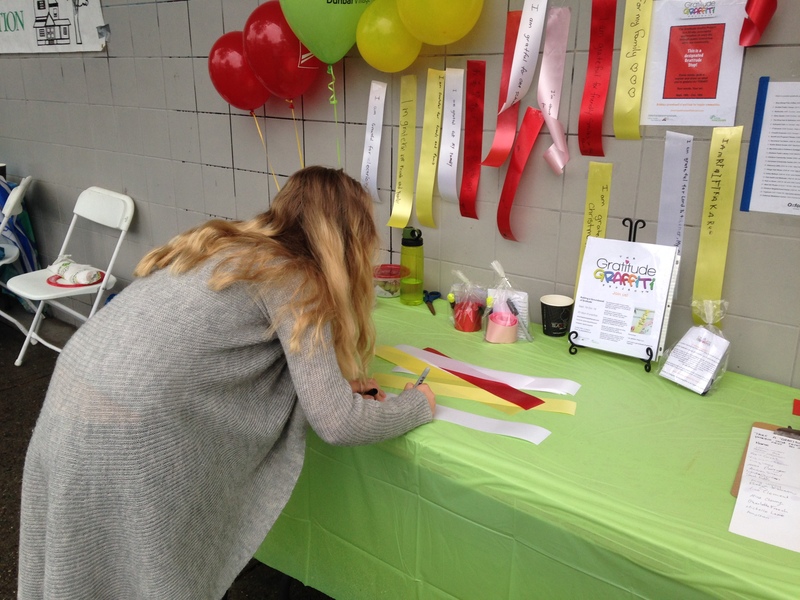 The Canadian Gratitude Graffiti Project kicks off in Vancouver! 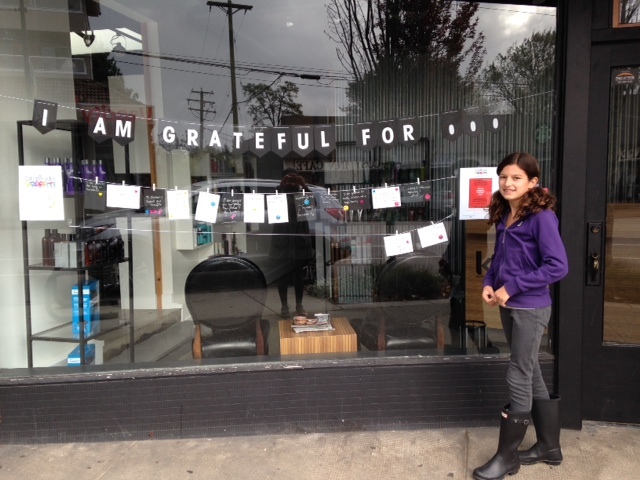 Vancouver is gearing up for The Gratitude Graffiti Project 2014! It kicks off Oct. 13th, Thanksgiving Day, for 30 days and will build a groundswell of gratitude for 30 days until Remembrance Day, Nov. 11th. Want to join this infectious movement? Click HERE and jump in! The Gratitude Graffiti Project is coming to Philadelphia! 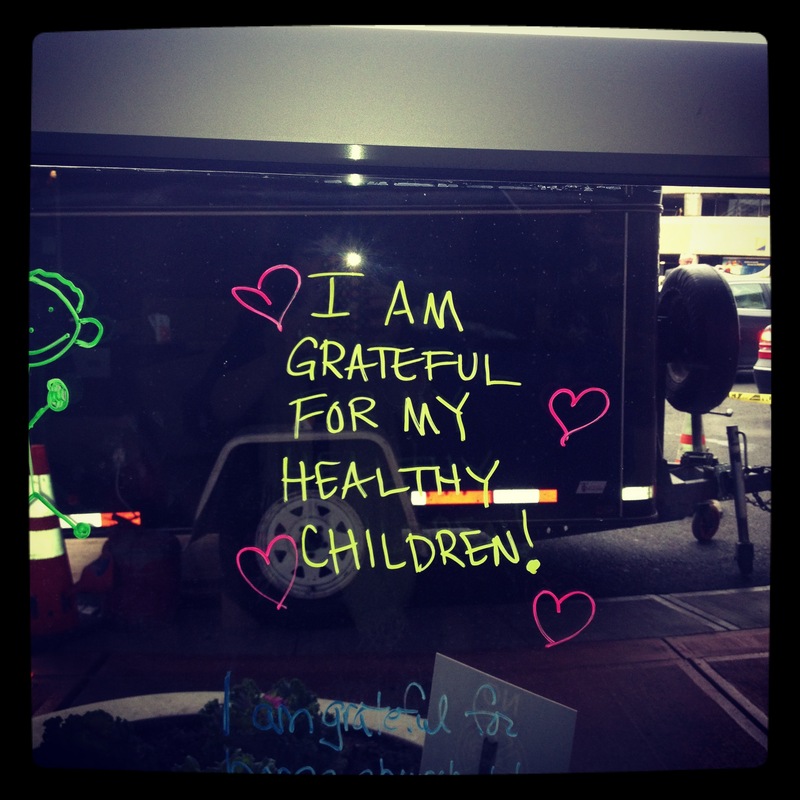 The Gratitude Graffiti Project will be at the University of Pennsylvania Healthy Cities Healthy Women Conference on May 15th! We are proud to be a visibility partner at this terrific event. Thank you to Dean Meleis and the staff at UPenn School of Nursing- Candice’s Alma Mater!